Can all of these dogs really get along? There are a lot of invisible dog fences on the market – the idea being it’s often easier to stake out wires or just have a signal that is transmitted 360 degrees around a given area than to actually put in a fence. It is definitely cheaper and easier, but is it a good idea? The best invisible dog fence you’ll find will offer safety, expandable ranges, “keep out” areas, and the wired invisible fences can be expanded to cover areas as large as 25 acres. Some of the wireless invisible dog fences are even portable so you can safely travel with your dogs with the knowledge that you can set up a 360 degree safe zone around an RV or camping site, for example. We have great success with invisible dog fences – at any given time we often have an assortment of dogs that will jump a fence or make a break through an open gate. We view the invisible dog fence as an affordable and safe backup for our physical fences. I grew up in the country, and I remember everybody owned a dog. The streets were not busy, had very little traffic and there was a lot of woods and fields for the dogs and their owners to roam. Walking around town and through the woods would reward you with a chance meeting of a friend also walking with their dog. The dogs were everywhere and often ran free but yet they all knew where to go when feeding time arrived or when the sun went down. I distinctly recall one time finding my own dog almost a mile from our home – I pulled over, got her into the car, and took her back home safely. She was exhausted and I could tell by her panting, tired look that she had been having a lot of fun and probably got into a bit of mischief. I think she appreciated the ride back home. Those days bring back fond memories but the days of letting your dogs run pretty much free are gone. The streets are busier, your neighbors are more likely to not like them running around and there seems to be plenty of local officials that are too happy to pick your dog up and take it to the pound. People these days seem to be more possessive of their space and letting your dog infringe on that space is a sure way to create conflict. Couple this with mostly legislated requirements to keep pets at home and well contained and we have a very good reason for an effective containment system around your home. A regular fence is the most common you’ll see from neighborhood to neighborhood. Keeping your pet on a leash is also common. Tying pets up in the backyard, these days, is frowned on (and rightfully so) and in fact is not sufficient in many areas due to local requirements to actually contain your pet, not just tie him up. Leaving a pet outside on a tie-down can be seen as inhumane as well as they can often be left outside during bad weather conditions and sometimes with no shelter. A relatively new method is to use radio frequency, or invisible fencing. The invisible fence will establish a border around your yard and when the pet approaches that border they are given a small shock or audible static via the collar. If they don’t turn around, they get another. If they get even closer they get a last, more powerful notice that is enough of a deterrent for even the most determined pet. After awhile, most users of invisible fences will say that their pets no longer even go near the borders and can roam outside even without the collar. A dog will learn it’s boundaries. Fences are not permitted in some areas and some Home Owners Associations as they can get old, need maintenance and eventually bring down the value of the surrounding homes if they are not well maintained. An invisible fence overcomes these problems by no being visible in the first place. Even if fences are allowed, dogs have a tendency to dig and many a dog has dug under many a fence and found their way into mischief. The invisible fence cannot be circumvented in this manner. Fences have gates and gates are occasionally left open. As with digging, many dogs have taken advantage of an open gate. An invisible fence has no gate to be left open and allows no point of exit a pet can take advantage of. Given the above reasoning, an invisible fence is worth consideration for anybody with pets. But how does it work? …but is it cruel? Isn’t mean to shock a dog into behaving? Well, is it cruel or mean to enable your dog to dig under a fence or run through a gate and get into traffic? My stance is that I’d rather spend a bit of time teaching my dog boundaries so they don’t get hurt. Yes, the negative stimulus received by the pet may cause some pain or aggravation. If it didn’t, it wouldn’t work. But many dogs only have to receive this stimulus a couple times to get the message. A more determined dog will receive it more times but then again, a more determined dog is also more determined to dig under a fence, jump over it, or wait for that gate to be left open. Do you need this even if you already have a fence? That depends. Do you have dogs that jump your fence? Would your dog run out of a gate that was left open? If so, then the invisible fence might still be a worthwhile consideration. Also, think of dogs when stressful situations occur. My dog, Rusty, stays in the yard all the time…until he sees a rabbit or a deer on the other side of the fence. About 50% of the time he sees something, this 75 pound pit bull sails over our 5 foot fence like it wasn’t even there and is off and chasing before anybody has a chance to react. And what about inclement weather. Some dogs, if outside, will run in panic after they see lightning or hear thunder. Another of our dogs – Bruno – is a Boxer mix that is horribly afraid of bad weather and we have to give him what we call “doggy downers” when a storm hits. If he were outside though, he’s run in panic, either through or over a fence. So give consideration of times when not everything is perfect to help you decide. Another consideration is if you have areas of your yard you’d like your pets to not go, such as a swimming pool, work area, garden, play yard, etc. An invisible fence around these areas will serve the same purpose. One of our pets, Jake, is a heavy set pit bull that absolutely loves the pool. The problem is, he swims like a brick and we have actually found him in the pool – unsupervised – clinging to the ladder and unable to get out. If we hadn’t found him, he would have drowned. An invisible fence around the pool would fix that problem. How do invisible fences work? There are couple of different methods – really two primarily. 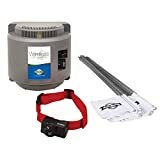 Either you’ll have wire buried around the perimeter of the area you want your dogs to have access to or you can have a central transmitter that sends a signal in a 360 degree circle the dogs can roam inside of. For the most part, any of the different types of wireless fences can work with any number of collars, and therefore can protect all your friends. This type of wireless invisible fence creates a 360 diameter around the transmitter. As long as the dog stays within that perimeter, they are fine. As they approach the perimeter, the collar will emit a static noise that the dogs typically don’t like. As they get closer to the perimeter, the static gets louder. The idea is that the dog will hear the static and turn around, back towards the inside of the “safe” perimeter. A transmitter is installed inside the house and is connected to a wire that runs around the perimeter of the boundary you choose. This wire acts as an antenna for the transmitter, sending radio frequency through the buried wire and into the air surrounding your yard. When your pet approaches this signal, it’s collar picks up the signal and sends an audio warning first to let the dog know it’s gone too far. As mentioned before, additional “notices” can be configured to get your dog’s attention as some dogs are more difficult to break out of a habit or get the attention of than others. As the dog tests the boundaries and receives warnings, it will eventually learn where it can go and where it shouldn’t go. You can buy a standard entry-level setup that will cover about 1/3rd of an acre but these units can be upsized by simply adding additional wire around the perimeter of the protected area. Another benefit here is that the area can be any shape you need it to be. Additionally, you can even add “keep out” areas within the perimeter so if you have a playground, garden or a pool for example, these areas can be inside the “safe” perimeter, yet “fenced off” from the rest. Is an invisible fence worth it? As with so many things, it depends. Our current home has about 7 acres which consists of a lot of wooded area, some fairly steep ravines and ridges, water runoff and a creek. It would be difficult to put in a physical fence without doing a lot of land clearing. The invisible fence has worked well for me in my situation. If you live in, for example, an HOA where getting a fence approved is difficult, an invisible fence is worth consideration. If you travel and like to take your furry friends with you, the wireless invisible fence is a great idea as you can set up the transmitter in your central area and the dogs will be contained. If you compare any of the above with putting in an actual fence or perhaps boarding your dogs while you take your RV across the country, the value (as well as the convenience) of an invisible fence is compelling. As dog lovers, my wife and I did a good bit of research to find the best invisible dog fence to protect our pack and we feel it’s money well spent.